Review by AllTheBestFights.com: 2018-10-20, some good exchanges between Emmanuel Tagoe and Paulus Moses but it is not enough to get three stars: it gets two. The former Ibo Lw champion Emmanuel Tagoe entered this fight with a boxing record of 28-1-0 (14 knockouts) and he is ranked as the No.9 lightweight in the world (currently the #1 in this division is Vasyl Lomachenko). He suffered his only loss at his first professional bout in 2014, against Lante Addy, since then he has won 28 consecutive fights beating Fernando David Saucedo in his last one (Emmanuel Tagoe vs Fernando David Saucedo). His opponent, the former Wba Lw champion Paulus Moses, has an official record of 40-4-0 (25 knockouts) and he entered as the No.35 in the same weight class but he comes off the loss against Raymundo Beltran (Raymundo Beltran vs Paulus Moses); before this bout, in 2017, he had defeated Crispin Moliati and Saidi Mundi. 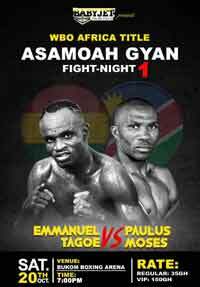 Tagoe vs Moses is valid for the vacant WBO Africa lightweight title. Watch the video and rate this fight!